Identification: Scott and Crossman (1973); Becker (1983); Smith (1985); Page and Burr (1991). Native Range: Atlantic drainages from Lake Melville, Newfoundland, to Delaware River, and Pennsylvania; Arctic and Pacific drainages from Bathurst Inlet, Northwest Territories, to Vancouver Island, British Columbia. Also, Pacific drainages of Asia (Page and Burr 1991). The origin of Osmerus mordax in Lake Ontario is disputed, as they are thought to be either native or introduced from the Atlantic through the Erie Canal (Mills et al. 1993). Another alternative is that O. mordax migrated downstream from the upper Great Lakes, where it is considered nonindigenous. Table 1. States with nonindigenous occurrences, the earliest and latest observations in each state, and the tally and names of HUCs with observations†. Names and dates are hyperlinked to their relevant specimen records. The list of references for all nonindigenous occurrences of Osmerus mordax are found here. Ecology: Rainbow smelt are zooplanktivorous at small sizes (<150 mm SL), consuming copepods and cladocerans (e.g., Daphnia and Bosmina), and include benthic crustaceans and small fishes into the diet at larger sizes (>150 mm SL; Sheppard et al. 2012). Means of Introduction: The earliest known record is from 1912, when eggs were stocked in Crystal Lake, Michigan, which drains into Lake Michigan (Van Oosten 1937). Fish escaped into Lake Michigan and spread quickly throughout the Great Lakes and their tributaries (Creaser 1926; Gerking 1945; Hubbs and Lagler 1947; Nelson and Gerking 1968; Christie 1974; Eddy and Underhill 1974; Smith 1979; Morrow 1980; Phillips et al. 1982; Cooper 1983; Emery 1985). Early records documenting the smelt's range expansion in the Great Lakes include Lake Michigan, 1923 (Christie 1974; Emery 1985), Lake Erie, 1935 (Cooper 1983; Smith 1985), Lake Huron, 1925 (Christie 1974; Eddy and Underhill 1974), Lake Ontario, 1929 (Christie 1974; Smith 1985), and Lake Superior, 1923 (Emery 1985). The Lake Ontario population may be either native to this lake or migrated downstream, possibly through the Welland Canal. (Emery 1985; Smith 1985). Another possibility is that the species was introduced from the Finger Lakes via the Seneca-Cayuga, Erie and Oswego canals (Smith 1985). Two means have been proposed to explain the introduction of rainbow smelt into the Missouri and Mississippi rivers. It may have spread from Lake Michigan via the Chicago sanitary canal to the Illinois River and then to the Mississippi and Missouri rivers (Burr and Mayden 1980). Alternatively, the species may have gained access to these rivers as a result of a stocking at Lake Sakakawea, North Dakota, in 1971 (Bouc 1987; Mayden et al. 1987; Holton 1990). The second explanation seems more plausible because of a lack of records from the Illinois River. Records of first occurrences in other areas include the Mississippi River, Illinois and Kentucky, 1978; Mississippi River, Louisiana, 1979; Mississippi River, Tennessee and Arkansas, 1980; Missouri River, Missouri, 1980; Missouri River, Kansas, 1982 (Mayden et al. 1987). Mayden et al (1987) provided a map of the species' distribution, dates of first observation in new areas, and possible introduction pathways. The species was originally introduced into Lake Sakakawea, North Dakota, as a forage for salmonids (Mayden et al. 1987). Status: Introduced populations of this species have been very successful and the rainbow smelt is now established in the Great Lakes and in most rivers and lakes where introduced. This species has done so well in the Great Lakes that a commercial fishery targeting smelt has been operating there for many years (Smith 1985). It is the most abundant fish in some samples taken from the Mississippi River (Pflieger 1997). Nevertheless, no adults of the rainbow smelt have been found in either Missouri (Pflieger 1997) or Tennessee (Etnier and Starnes 1993). As such, Pflieger (1997) concluded that populations in Missouri are maintained by continued escape of fish from upstream reservoirs on the Missouri River. As of 1987, only one specimen had been taken from the Ohio River (Mayden et al. 1987). It is considered extirpated in Georgia; the species has not been observed in that state since its release (Dahlberg and Scott 1971b). Remarks: This species is eaten by humans and used as bait for salmonids and walleye (Pflieger 1997). O'Brien et al. (2014) investigated ecological factors influencing recruitment of rainbow smelt in Lake Huron, and suggest that the primary drivers on recruitment were cannabalism by older smelt, availabilty of spawning habitat due to spring precipitation, and predation on adult smelt by lake trout. Feiner et al. (2015) examined recruitment dynamics of rainbow smelt in Lake Michigan, and found that significant variation in stock productivity over time had a strong influence on recruitment. Becker, G.C. 1983. Fishes of Wisconsin. University of Wisconsin Press, Madison, WI. Brandt, S.B., and S.P. Madon. 1986. Rainbow smelt (Osmerus mordax) predation on slimy sculpin (Cottus sognatus) in Lake Ontario. Journal of Great Lakes Research 12(4):322-325. Burr, B.M., and R.L. Mayden. 1980. 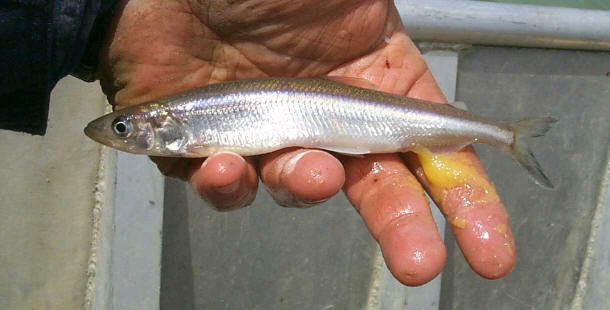 Dispersal of rainbow smelt, Osmerus mordax, into the upper Mississippi River (Pisces:Osmeridae). American Midland Naturalist 104(1):198-201. Burr, B.M., and L.M. Page. 1986. Zoogeography of fishes of the lower Ohio-upper Mississippi basin. Pages 287-324 in C.H. Hocutt, and E.O. Wiley, eds. The zoogeography of North American freshwater fishes. John Wiley and Sons, New York, NY. Burr, B.M., and M.L. Warren, Jr. 1986. A distributional atlas of Kentucky fishes. Scientific and Technical Series No. 4. Kentucky State Nature Preserves Commission, Frankfort, KY.
Burr, B.M., D.J. Eisenhour, K.M. Cook, C.A. Taylor, G.L. Seegert, R.W. Sauer, and E.R. Atwood. 1996. Nonnative fishes in Illinois waters: What do the records reveal? Transactions of the Illinois State Academy of Science 89(1/2):73-91. Chernyak, S.M., C.P. Rice, R.T. Quintal, L.J. Begnoche, J.P. Hickey, and B.T. Vinyard. 2005. Time trends (1983-1999) for organochlorines and polybrominated diphenyl ethers in rainbow smelt (Osmerus mordax) from Lakes Michigan, Huron, and Superior, USA. Environmental Toxicology and Chemistry 24(7):1632-1641. Christie, W.J. 1974. Changes in the fish species composition of the Great Lakes. Journal of the Fisheries Research Board of Canada 31:827-854. Clearwater, S.J., C.W. Hickey, and M.L. Martin. 2008. Overview of potential piscicides and molluscicides for controlling aquatic pest species in New Zealand. Science & Technical Publishing, New Zealand Department of Conservation, Wellington, New Zealand. Cooper, E.L. 1983. Fishes of Pennsylvania. Pennsylvania State University Press, University Park, PA.
Creaser, C.W. 1926. The establishment of the Atlantic smelt in the upper waters of the Great Lakes. Papers of the Michigan Academy of Science, Arts, and Letters 5(1925):405-424. Cross, F.B., R.L. Mayden, and J.D. Stewart. 1986. Fishes in the western Mississippi drainage. Pages 363-412 in C.H. Hocutt, and E.O. Wiley, eds. The zoogeography of North American freshwater fishes. John Wiley and Sons, New York, NY. Crossman, E.J. 1991. Introduced freshwater fishes: a review of the North American perspective with empahsis on Canada. Canadian Journal of Fisheries and Aquatic Sciences 48(S1):46-57. Dahlberg, M.D., and D.C. Scott. 1971a. The freshwater fishes of Georgia. Bulletin of the Georgia Academy of Science 29:1-64. Dahlberg, M.D., and D.C. Scott. 1971b. Introductions of freshwater fishes in Georgia. Bulletin of the Georgia Academy of Science 29:245-252. Dann, S.L., and B.C. Schroeder. 2003. The Life of the Lakes: A Guide to the Great Lakes Fishery. 56 pp. Denoncourt, R.F., T.B. Robbins, and R. Hesser. 1975. Recent introductions and reintroductions to the Pennsylvania fish fauna of the Susquehanna River drainage above Conowingo Dam. Proceedings of the Pennsylvania Academy of Science 49:57-58. Dextrase, A.J., and N.E. Mandrak. 2006. Impacts of alien invasive species on freshwater fauna at risk in Canada. Biological Invasions 8:13-24. Dobiesz, N.E., D.A. McLeish, R.L. Eshenroder, J.R. Bence, L.C. Mohr, M.P. Ebener, T.F. Nalepa, A.P. Woldt, J.E. Johnson, R.L. Argyle, and J.C. Makarewicz. 2005. Ecology of the Lake Huron fish community, 1970-1999. Canadian Journal of Fisheries and Aquatic Sciences 62:1432-1451. Eddy, S., and J.C. Underhill. 1974. Northern Fishes, with Special Reference to the Upper Mississippi Valley, 3rd edition. University of Minnesota Press, Minneapolis, MN. Emery, L. 1985. Review of fish introduced into the Great Lakes, 1819-1974. Great Lakes Fishery Commission Technical Report, volume 45. Etnier, D.A., and W.C. Starnes. 1993. The fishes of Tennessee. University of Tennessee Press, Knoxville, TN. Evans, D.O. and D.H. Loftus. 1987. Colonization of inland lakes in the Great Lakes region by rainbow smelt, Osmerus mordax: Their freshwater niche and effects on indigenous fishes. Canadian Journal of Fisheries and Aquatic Sciences 44:249-266. Ferguson, T.B. 1876. Report of the Commissioners of Fisheries of Maryland to the General Assembly. 1 January 1876. John F. Wiley, Annapolis, MD. Gerking, S.D. 1945. Distribution of the fishes of Indiana. Investigations of Indiana Lakes and Streams 3:1-137. Gould, W.R. 1981. First records of the rainbow smelt (Osmeridae), sicklefin chub (Cyprinidae), and white bass (Percicthyidae) from Montana. Proceedings of the Montana Academy of Sciences 40:9-10. Gorman, O.T. 2007. Changes in a population of exotic rainbow smelt in Lake Superior: Boom to bust, 1974-2005. Journal of Great Lakes Research 33:75-90. Hamel, M.J., M.L. Brown, and S.R. Chipps. 2008. Behavioral responses of rainbow smelt to in situ strobe lights. North American Journal of Fisheries Management 28(2):394-401. Hanten, R.L. - Department. of Game, Fish, and Parks, Pierre, SD. Response to NBS-G nonindigenous questionaire. Harlan, J.R., E.B. Speaker, and J. Mayhew. 1987. Iowa fish and fishing. Iowa Department of Natural Resources, Des Moines, IA. Hartel, K. 1992. Non-native fishes known from Massachusetts freshwaters. Occasional Reports of the MCZ Fish Department 2:1-9. Hartel, K.E., D.B. Halliwell, and A.E. Launer. 2002. Inland fishes of Massachusetts. Massachusetts Audubon Society, Lincoln, MA. Hartman, W.L. 1973. Effects of exploitation, environmental changes, and new species on the fish habits and resources of Lake Erie. Technical Report Number 22. Great Lakes Fishery Commission, Ann Arbor, MI. Havey, K.A. 1973. Effects of a smelt introduction on growth of landlocked salmon at Schoodic Lake, Maine. Transactions of the American Fisheries Society 102(2):392-397. He, X. and G.W. LaBar. 1994. Interactive effects of cannibalism, recruitment, and predation on rainbow smelt in Lake Champlain: a modeling synthesis. Journal of Great Lakes Research 20(1):289-298. Hendricks, M.L., J.R. Stauffer, Jr., C.H. Hocutt, and C.R. Gilbert. 1979. A preliminary checklist of the fishes of the Youghiogheny River. Chicago Academy of Sciences, Natural History Miscellanea 203:1-15. Hocutt, C.H., R.E. Jenkins, and J.R. Stauffer, Jr. 1986. Zoogeography of the fishes of the central Appalachians and central Atlantic Coastal Plain. Pages 161-212 in C.H. Hocutt, and E.O. Wiley, eds. The zoogeography of North American freshwater fishes. John Wiley and Sons, New York, NY. Holton, G.D. 1990. A field guide to Montana fishes. Montana Department of Fish, Wildlife and Parks, Helena, MT. Hrabik, T.R., M.P. Carey, and M.S. Webster. 2001. Interactions between young-of-the-year exotic rainbow smelt and native yellow perch in a northern temperate lake. Transactions of the American Fisheries Society 230:568-582. Hrabik, T.R., J.J. Magnson, and A.S. McLain. 1998. Predicting the effects of rainbow smelt on native fishes is small lakes: evidence from long-term research on two lakes. Canadian Journal of Fisheries and Aquatic Sciences 55:1364-1371. Hubbs, C.L., and K.F. Lagler. 1947. Fishes of the Great Lakes region. Cranbrook Institute of Science. Bulletin 26:1-186. Bloomfield Hills, Michigan. Kirn, R.A. and G.W. LaBar. 1996. Growth and survival of rainbow smelt, and their role as prey for stocked salmonids in Lake Champlain. Transactions of the American Fisheries Society 125(1):87-96. Krueger, D.M., and T.R. Hrabik. 2004. Food web alterations that promote native species: the recovery of cisco (Coregonus artedi) populations through management of native piscivores. Canadian Journal of Fisheries and Aquatic Sciences 62:2177-2188. Linder, A.D. 1963. Idaho's alien fishes. Tebiwa 6(2):12-15. Madenjian, C.P., G.L. Fahnenstiel, T.H. Johengen, T.F. Nalepa, H.A. Vanderploeg, G.W. Fleischer, P.J. Schneeberger, D.M. Benjamin, E.B. Smith, J.R. Bence, E.S. Rutherford, D.S. Lavis, D.M. Robertson, D.J. Jude, and M.P. Ebener. 2002. Dynamics of the Lake Michigan food web, 1970-2000. Canadian Journal of Fisheries and Aquatic Sciences 59:736-753. Marking, L.L., T.D. Bills, J.J. Rach, and S.J. Grabowski. 1983. Chemical control of fish and fish eggs in the Garrison Diversion Unit, North Dakota. North American Journal of Fisheries Management 3(4):410-418. Mayden, R.L., F.B. Cross, and W.T. Gorman. 1987. Distributional history of the rainbow smelt, Osmerus mordax (Salmoniformes: Osmeridae), in the Mississippi River Basin. Copeia 1987(4):1051-1054. Menhinick, E.F. 1991. The freshwater fishes of North Carolina. North Carolina Wildlife Resources Commission, Raleigh, NC. Mercado-Silva, N., G.G. Sass, B.M. Roth, S. Gilbert, and M.J. Vander Zaden. 2007. Impact of rainbow smelt (Osmerus mordax) invasion on walleye (Sander vitreus) recruitment in Wisconsin lakes. Canadian Journal of Fisheries and Aquatic Science 64:1543-1550. Mills, E.L., J.H. Leach, J.T. Carlton, and C.L. Secor. 1993. Exotic species in the Great Lakes: a history of biotic crisis and anthropogenic introductions. Journal of Great Lakes Research 19(1):1-54. Morrow, J.E. 1980. The freshwater fishes of Alaska. Alaska Northwest Publishing Company, Anchorage, AK. Nelson, J.S., and S.D. Gerking. 1968. Annotated key to the fishes of Indiana. Project 342-303-815. Department of Zoology, Indiana Aquatic Research Unit, Indiana State University, Bloomington, IN. Patrick, P.H., A.E. Christie, D. Sager, C. Hocutt, and J. Stauffer, Jr. 1985. Responses of fish to a strobe light/air-bubble barrier. Fisheries Research 3:157-172. Pennington, C.H., G.J. Dahl, and H.L. Schramm, Jr. 1982. Occurrence of the rainbow smelt in the lower Mississippi River. Journal of the Mississippi Academy of Sciences 27:41-42. Pflieger, W.L. 1997. The fishes of Missouri. Missouri Department of Conservation, Jefferson City, MO. Phillips, G.L., W.D. Schmid, and J.C. Underhill. 1982. Fishes of the Minnesota region. University of Minnesota Press, Minneapolis, MN. Propst, D.L., and C.A. Carlson. 1986. The distribution and status of warmwater fishes in the Platte River drainage, Colorado. Southwestern Naturalist 31(2):149-167. Schmidt, S.N., M.J. Vander Zaden, and J.F. Kitchell. 2009. Long-term food web change in Lake Superior. Canadian Journal of Fisheries and Aquatic Sciences 66(12):2118-2129. Scott, W.B., and E.J. Crossman. 1998. Freshwater gishes of Canada. Galt House Publications, Oakville, Ontario. Sheppard, K.T., A.J. Olynyk, G.K. Davoren, and B.J. Hann 2012. Summer diet analysis of the invasive rainbow smelt (Osmerus mordax) in Lake Winnipeg, Manitoba. Journal of Great Lakes Research 38(Supplement 3):66-71. Smith, J.V.C. 1833. A Natural History of the Fishes of Massachusetts. A reprint of the 1833 edition. Freshet Press, Inc., Rockville Center, NY. Smith, P.W. 1979. The fishes of Illinois. University of Illinois Press, Urbana, IL. Stedman, R.M., and R.L. Argyle. 1985. Rainbow smelt (Osmerus mordax) as predators on young bloaters (Coregonus hoyi) in Lake Michigan. Journal of Great Lakes Research 11(1):40-42. Stewart, D.J., J.F. Kitchell, and L.B. Crowder. 1981. Forage fishes and their salmonid predators in Lake Michigan. Transactions of the American Fisheries Society 110(6):751-763. Stockwell, J.D., M.P. Ebener, J.A. Black, O.T. Gorman, T.R. Hrabik, R.E. Kinnunen, W.P. Mattes, J.K. Oyadomari, S.T. Schram, D.R. Schreiner, M.J. Seider, S.P. Sitar, and D.L. Yule. 2009. A synthesis of cisco recovery in Lake Superior: Implications for native fish rehabilitation in the Laurentian Great Lakes. North American Journal of Fisheries Management 29(3):626-652. Suttkus, R.D., and J.V. Conner. 1980. The rainbow smelt, Osmerus mordax, in the lower Mississippi River near St. Francisville, Louisiana. American Midland Naturalist 104(2):394. Todd, T.N. 1986. Artificial propagation of coregonines in the management of the Laurentian Great Lakes. Archiv für Hydrobiologie–Beiheft Ergebnisse der Limnologie 22:31-50. U.S. Environmental Protection Agency (USEPA). 2008. Predicting future introductions of nonindigenous species to the Great Lakes. National Center for Environmental Assessment, Washington, DC; EPA/600/R-08/066F. Available from the National Technical Information Service, Springfield, VA, and http://www.epa.gov/ncea. Van Oosten, J. 1937. The dispersal of smelt, Osmerus mordax (Mitchill), in the Great Lakes region. Transactions of the American Fisheries Society 66:16-171. Webster, D.A. 1942. The life histories of some Connecticut fishes. Pages 122-227 in State Board of Fisheries and Game. A fishery survey of important Connecticut lakes. Connecticut Geological and Natural History Survey 63. Werner, R.G. 1980. Freshwater fishes of New York State: a field guide. Syracuse University Press, Syracuse, NY. Wisconsin Department of Natural Resources, Northern Region. 2003. WI DNR Database. Woodling, J. 1985. Colorado's little fish: a guide to the minnows and other lesser known fishes in the state of Colorado. Colorado Division of Wildlife, Denver, CO.
Young, B.A., T.L. Welker, M.L. Wildhaber, C.R. Berry, and D. Scarnecchia, editors. 1997. Population structure and habitat use of benthic fishes along the Missouri and lower Yellowstone rivers. Annual Report of Missouri River Benthic Fish Study PD-95-5832. U.S. Army Corps of Engineers and the U.S. Bureau of Reclamation. 207 pp.